Up The Creek Xpeditions is proud to announce a new addition to our Big Canoe fleet – hand-built by Jennifer’s father, Woody Harrell. A master craftsman and boat captain, Woody was inspired by Jennifer’s Big Canoe adventures and decided to build her not only a boat, but a work of art that would last a lifetime. With a little help from Jennifer’s uncle Tommy (a boat-builder and canoeist) and a couple friends, Woody’s masterpiece was completed in December of 2015 and named, “The River Queen” – a name inspired by his river-going daughter. The River Queen is a “strip-built canoe,” painstakingly constructed of over 2,000 hand-cut strips of reclaimed select White Cypress with Spanish Cedar and Oak trim, thwarts and gunwales. To achieve the elegant lines and shape of the River Queen, thin strips of Cypress were cut and bent over forms one at a time to form the hull. The strips are then stitched and glued together, trimmed and sanded and then covered with several layers of fiberglass, resin and varnish. Many of the curves require the wood to be steamed and bent or twisted to conform to the builder’s design. At over 20-feet in length and nearly 4-feet in beam, the River Queen is a BIG canoe. 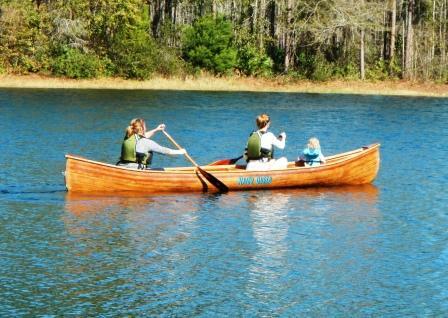 Designed as a freighter, this canoe is capable of carrying over 1,500-pounds of cargo – or about 8-people. The River Queen was custom-built to carry both passengers and cargo. With a bow seat, stern seat and two wider seats towards the center of the canoe, the River Queen can accommodate 4-6 paddlers with plenty of leg-room and space for gear. Canoes like this are often used like workhorses for many decades; and The River Queen will be no different. The River Queen entered service earlier this month as the third Big Canoe in Up The Creek’s growing fleet of giant boats. The new canoe complements the larger canoes by accommodating smaller groups and overflow or extra gear for larger groups. The River Queen will be a frequent and impressive sight for boaters on Lofton Creek, the St. Marys River and all of our most popular Big Canoe adventures. 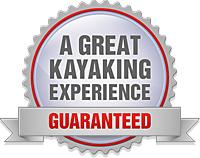 To set up a Big Canoe tour and see the most impressive canoes in the Southeast, just visit: http://www.BigCanoeFun.com and give us a call or email with your inquiry. 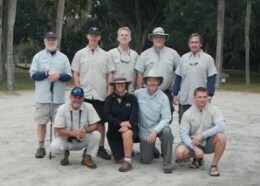 ← Up The Creek Xpeditions takes the Rock The Park guys on a Cumberland Island Adventure!